Fixing Grace : XO vision XD107 MP3 Player Review. XO vision XD107 MP3 Player Review. From my continuing review on the Dakota, one of the things I wanted for it was a radio that had a Bluetooth for my phone, a navigational system, and an MP3 player. While the Pioneer worked, the color changing every time I went to change the volume got to be frustrating at best and dangerous because there was no easy way to turn the radio down or answer the phone hands free. I priced out some systems, including used ones at a pawnshop, and the cheapest was $300. My GPS still works, sort of and I can rig a system for my iPad at some point to act as a navigational aid. I could always pick up a Garmin at some point. The real issue was being able to go hands free with the cell phone and get rid of the CD's; saving valuable space in the truck and preventing another distraction behind the wheel. Yes, I could have bought a Ram Promaster City, Transit Connect, or Chevy City Express with these features, but the cost of these was too much to put up with for a vehicle that can only work. A pickup truck can haul anything and I can carry more than one other person in mine. A van will be in my future eventually, but this is a much more expensive story. Besides, this unit boasts all of the connectivity for under $20. A bit skeptical, I bought the last one Walmart had on the shelf and in about an hour had this in my truck. It took me another couple hours to load my music collection onto a 2GB SD card, but you can also use a flash drive, which I also have. The SD cards I have are bigger than the flash drives I have, save one. The manual is pretty straightforward and the control are a bit small and more than a little simplistic. Volume, tone, and other audio control are intuitive, as are scrolling through the tracks. It also comes with a remote, which is good when you can play the stereo while outside the truck. I like the fact it shows the track with a song and singer, but some words will need to be interpreted as they will scroll if they are larger than the six characters allotted by the blue LED screen. The radio has three FM settings, but no AM at all. If you like listening to talk radio, this could be a dealbreaker. I personally like listening to the local Christian stations on the FM anyway, so no worries. Advancing through the music selections is also simplistic; either back ten, forward ten, or back or forward one at a time. Presets and setting the time is also easy to do. 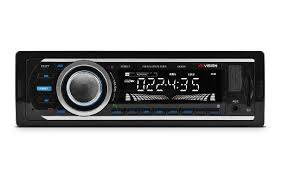 Shutting off the radio also means not seeing the clock, which can be a pain. The hands free set up is really easy. Just pair up your phone (iPhone or 'Droid) with the unit and it will cut off the radio and signal you to answer the phone or decline the call. My only issue is that the buttons are a bit on the small side (as they are on most aftermarket systems) but the sound is as good as any OEM system one work vans or trucks that cost a decent house payment a month. Is this system perfect? The answer is no. However, this is a very cheap alternative to buying the aforementioned "new" vehicles with the big payments, or some sound system that could get jacked in a bad part of town. I will post follow ups from time to time and if it calls it quits or I get tired of it, I'll post that too. Maranatha! Pickup Truck Bed Cover On the Cheap. Silicone Wedding Rings Revisited and a Caution. Refrigerator Water Filter Foible Fix.